I Am a Real Man! When I was about ten years old, an old man a few doors down died. I had seen pets die so I knew what death meant, but that was the first time a person I knew had died. I kept thinking about it and one night it dawned on me that everybody dies, including my mother. I was overcome with sadness and cried myself to sleep but the thought stayed with me forever. I tempered that sadness by telling myself it wouldn’t happen for a very long time. As I grew older and moved away, the fear became that I would not be there when she died. Still, surely that was a long way away. On the night of April 29, 2010, I received a phone call from my sister asking if I could please come home; she said Mother wanted to see all her children one last time. It had been years since we were all in the same room, so I couldn’t say no. It had been a very long day, after many long days, but I told her I’d be there “tomorrow.” She said Mother wanted to talk to me and held the phone for her so she could talk. Her voice was so weak I could barely hear. She told me she loved me and was very proud of me. For whatever reason, ou mother rarely said, “I love you.” When I say rarely, I mean as in I can remember every time she said it. You may be thinking, “Oh, how sad.” I would ask that you reserve judgment until you read the rest of the story. What she did say a lot was, “Talk is cheap.” No two ways about it, she was saying goodbye. That fear I’d had all my life swept over me like a tsunami. I said, “Mother, I’ll be there tomorrow; please wait.” Like so many delicate conversations we’d had before, you had to fill in the gaps. “I’ll wait,” was her simple reply. I don’t fall asleep behind the wheel because I don’t get behind the wheel when I’m sleepy. There was no way I could leave that night but I asked my wife to pack my clothes and went to bed. I woke up at four the next morning and not only had she packed my clothes, she had packed snacks for the trip. Another remarkable woman, but I’ll save that for another day. I swung by the client I had been working with, scribbled some notes that basically said, I’ve got to go see my mother; you’re on your own. I was below Atlanta before morning traffic. When I made it to Macon, GA, I felt it was late enough to call home again. I had little to say; “I’m in Macon. Please wait.” In a voice so weak it betrayed the conviction she tried to convey, she said, “I’ll wait.” We repeated that conversation when I got to the Florida line, to Ocala, to Tampa . . . and each time I was sure I wouldn’t make it in time. But finally I did. I wasn’t prepared for the shock. I had been home a few months before and left thinking she’ll probably pull through again. Not this time. She was so weak all she could do was open her eyes and smile. It was obvious there was not going to be any “pulling through.” The nurse who came to check on her told us she had maybe a day or two left. I wasn’t happy about that, but at least I was there. I fully expected she would not last the night but early Saturday morning, she woke up and before long we were all gathered around her bed. It’s weird, but we had a good time. Mother’s sense of humor was still there. She said, “Give me my clock.” I thought it was a bit strange; maybe she was delusional, maybe they were just words coming out at random. So I asked, “You want to know the time? !” Without skipping a beat, she said, “Why else would I ask for my clock?” I now own that clock and always chuckle when I look at the time. Her wisdom was also still there. When we asked if she had any final words for each of us, she nailed it. Most of us got three or four words, but they were golden. Amazing how well and thoroughly she knew each of her children. Finally, she asked to go back to sleep. What an unbelievable gift. I thought I had talked to her for the last time but, out of nowhere, here were a few more moments. And it wasn’t over yet. Throughout Saturday, Sunday and Monday, grandchildren came and went and, for each one, she opened her eyes and gave them a smile which I’m sure made each one feel they were the special one. We thought she was asleep but apparently not because, for each one, we only had to mention their name and her eyes would open immediately and then she would smile. By Sunday night, the nurses were telling us she only had a few more hours; not sure why they kept telling us that. They gave us a little booklet about what to expect when someone was dying. As each one returned, they seemed surprised that she was still alive but would still tell us she only had a few more hours to live. Two of my sons hadn’t seen their grandmother in quite a while; they decided to come see her even though time was running out. I told them that would be great, but to keep in mind they probably would not make it in time. They came anyway. In hindsight, I can only conclude that mother must have heard. She would open her eyes every hour or so and look at the clock. I wondered what she was doing. Early Tuesday morning she called out and when I went in, she was trying to tell me something. My oldest sister, Fran, came in and tried to help. Do you want water? No. Do you want to sit up? No. With each question, she would look at us with a “where did I go wrong with these children?” expression. She pointed to a sheet of paper and tried to write. That didn’t work either. She kept saying “I… want…” and then would point to the hallway. After about an hour of this, Fran asked if she wanted her chair. She nodded her head up and down. I have to tell you about this chair! It turns out this was a little secretarial chair that my sisters had been using to help move her from her bed to her recliner. This was insanity! Dumbfounded, I asked mother if she wanted to go sit in her recliner. I’ll never forget that look; she couldn’t talk, but the message came through loud and clear: “Duh!” Another thing you need to know about my mother: to say she was stubborn is like saying Warren Buffett has a lot of money. She wanted out of her bed and into her recliner, and it was going to happen. I have no idea how I agreed to become part of this scheme, but I did. Fragile as she was, we put her in that tiny chair, wheeled her out and put her in her recliner. When the nurse came in later that morning, she looked at our mother, put on an incredulous expression and asked, “How did you move her?” “Lady, you don’t want to know,” was all I could say. Once again, “She only has a few hours to live,” was the nurse’s diagnosis. To say my sons move slowly is to say Donald Trump has a lot of money. For the financially illiterate, Buffett is worth about $40 billion; Trump about $2. It was almost noon before they were actually on the road. Each time I talked to them I was within earshot of mother, but I really did not think she could hear. “Hurry, but don’t hurry.” Being a parent makes you say strange things. What exactly does that mean? Still, I said it. I also said that they should be prepared not to make it in time. I noticed Mother kept looking at the clock every hour or so, and I wondered if she knew my boys were coming and was waiting. By Tuesday night, a male nurse said she only had an hour to live. I mentioned that she didn’t seem to be progressing as quickly as “the book” indicated. He kindly told me he’d been doing this for forty-four years. “She has less than an hour to go,” he repeated. The nurse’s shift came and went; Mother didn’t. It was after midnight so I called my boys and told them to pull over and rest; there was no way they were going to make it in time and I didn’t want them driving while sleepy. Once again, I was within earshot of mother. I did not believe she knew what was going on. One o’clock, two o’clock, three o’clock, four. Still here; still looking at the clock. Early Wednesday morning, my boys called and told me they were back on the road. Once again, I told them to be prepared for not making it in time. Finally, they walked in and I touched mom’s leg to see if she could still respond. To my amazement, she opened her eyes, smiled that huge grin and tried to say hello. She waited! She then closed her eyes. We started retelling the stories of the prior week, laughing at Mom’s one-liners. You could see that she was listening and even smiled a time or two. Finally, she let go and started to do like “the book” said she would. At 10:20 A.M. on 5/5/2010, a nurse pronounced our mother dead. It was the most amazing thing I have ever seen. She had put death itself on hold for her children’s sake. Compared to that, it’s true; talk is cheap. The heat had pretty much devastated my tomato plants so I decided to clean out the dead leaves, apply some of my compost, and see what I could do for the poor things. Lots of dead leaves, lots of picking, and lots of time for my mind to wander. I started thinking about that recent news report that said one in seven Americans lives in poverty and I think I know what the problem is. The government! I know you already know that, but do you really know why? I didn’t think so! I’ll explain. It has to do with my fence. You’ve seen my fence in the background many times if you’ve read any of my blogs, but I’ve tried not to let you have too close of a look. It needs painting, badly. It needs repairs, badly. I’ve been involved in painting that fence three times now and I know what I’m up against. Over three thousand linear feet of boards that need to be pressure washed, primed and painted on both sides. I DON’T WANT TO DO THAT. I would rather pick leaves off the tomatoes. 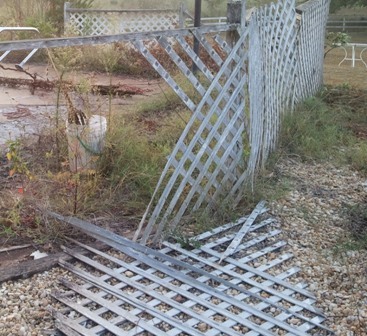 My wife keeps telling me the fence is fine as it is but to me, it really needs some work and the longer I wait, the more work it’s going to need. So here we have an excellent opportunity for the free enterprise system to work its magic. I’ll hire someone to paint the fence. Now I’m thinking this is not going to be terribly expensive; after all, my three boys did it the last time and they were only eleven, twelve and sixteen at the time. Except for painting each other head to toe in white latex, they did a pretty good job. The latex incident seems funny now, though I don’t remember laughing at the time. Painting the fence is not hard work: point the pressure washer at the fence and move back and forth until the paint goes away; dip the brush in the paint, move back and forth until the fence is again covered in paint. It’s so easy a twelve year old could do it. Wait, I already said that. So anyway, I decide to get a quote. Now I have a dilemma: do I paint the fence or do I buy a new truck? (Did you hear the one about the guy who got quite aroused when he met a girl wearing leather? She smelled like a new truck! I’m off track again.) So, I learn that by the time this poor fellow (who is driving a new truck) pays his overhead, payroll, workman’s comp, his portion of social security, the CPA to figure it all out, the attorney to write everything up so he stays out of trouble, medical and dental, and… I’m not listening anymore because I’ve gotten bored and gone to sleep. I am so glad the government wants to help me get my fence painted but that seems a bit expensive. Maybe I can skip all this bureaucracy and just find the guy who holds the paint brush. Not so easy. Apparently, once again, I’d be breaking the law. What a pain! 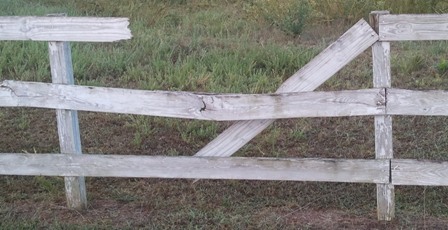 I just want someone to paint the fence at a low enough price that I would not be willing to do it myself. Why has this gotten so complicated? I could go around the system, but that’s a little complicated too. Can you imagine me having to don a hat and cape to go down to the corner of Trouble and Main, where lots of people hang out with nothing to do, and walking up to one and saying, “Psst, hey buddy, you know anyone who can paint a fence and keep quiet about it?” I’m sure the guy’s response would be, “Are you crazy, man? Yu messin with the IRS. Ain’t nobody round here gonna mess with the IRS. They brought down AL Capone, man. You crazy. Get out of here.” I don’t think I’ll try that, those guys don’t seem all that friendly, anyway. So, our helpful government has modified our free enterprise system so much that now, getting a fence painted involves an attorney, a CPA, a bookkeeper, an environmental engineer, a CEO and an IT guy to keep all the communication lines open. Oh, I forgot, it also still involves a guy who can hold a paint brush. Economists refer to this as “friction.” Blockade sounds more like it! You know what… I’m thinking my wife is right. 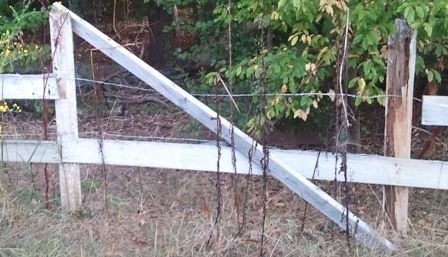 That fence looks just fine the way it is. On the off chance that you do care what my fence looks like, I’ll need you to follow some simple instructions when you come up my driveway. For the first thirty feet, I’ll need you to only look hard left. Then with a downward sweep of your eyes, I’ll need you to look only hard right. Finally, for the last fifty feet, please, I beg you, just close your eyes altogether and honk the horn. I’ll come and lead you by the hand into the house. Amazing what a little TLC and compost can do for a plant. 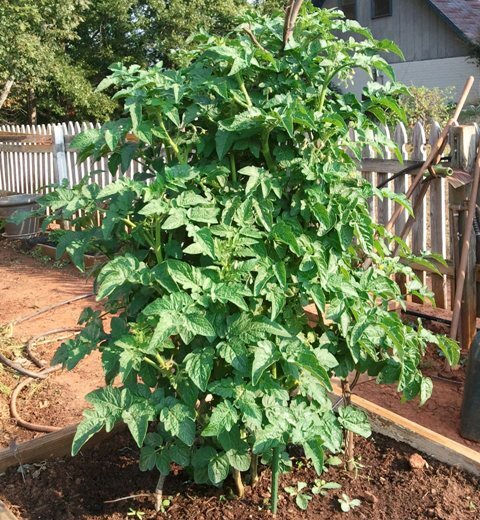 I transplanted this cherry tomato from a pot and used some of my new found compost to see if I could bring it back to life. I believe I succeeded! after a month of watering and adding a little more compost, there are numerous blooms and several small tomatoes. I believe a little strutting is in order! This is so much fun! It would appear Roses like the TLC and manure treatment as well. 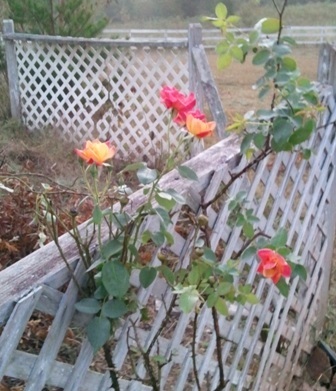 Here is a before and after picture of the Roses I discovered. This is only after a couple of weeks! While you chuckle about all the different ways CNN could spin that headline, I’ll continue with an explanation. When my now-wife and I announced our plans to be married to her mother, Lila, we were sitting on the back porch at Lila’s house. As usual, Lila was not sitting. She started fiddling with her plants and decided she needed to do some pruning. She turned to me and said, “Let me borrow your pocket knife.” Well, I didn’t have a pocket knife! She looked at me with disgust and in a “shocked disbelief” tone said, “You don’t carry a POCKET knife? !” I didn’t know enough to be embarrassed. She huffed off to the kitchen and came back with a KITCHEN knife and just to make sure I understood my little faux pas she said, “A real man carries a knife,” in a tone your mother might have used when she said “Gentlemen do not burp at the table.” On the next gift giving occasion, she gave me a knife. Well, my dear departed Lila Belle, you’ll be glad to know I now carry a knife. (Dear airport security person: rest assured I only carry a knife when I’m in the garden. If I’m not wearing overalls or really dirty pants, you can be sure I do not have a knife on me.) What innocence we’ve lost! 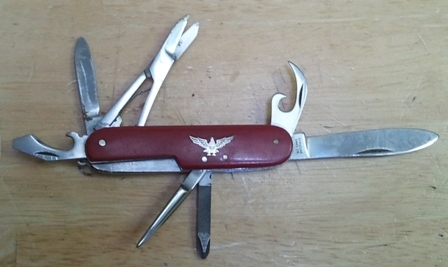 In a time when six year old boys are expelled for bringing toy soldiers to school, it must be really strange to hear someone say, “A real man carries a knife.” Lila presented me with a couple more pocket knives over the years just to make sure my manhood remained intact; I think this is one of them. I love this new weight reduction plan where I just do anything I want to do so long as it burns calories. Or so I thought! 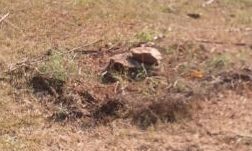 There I was checking on my resurrected rose, which is looking so much better than it did, when I catch sight of four tree stumps from chopped down Bradford pear trees. I decided it was time for the stumps to go. I cut them down a few years back, so I was thinking this would be a not too difficult task. Well, it wasn’t, except for the fourth one. I believe it was petrified. I don’t mean like, “Oh, I’m so afraid! This big guy is coming after me with an axe!” petrified. More like “Go ahead, sharpen your axe and see if you can get a piece of me” petrified. With the first three, I used an unsharpened axe, and a solid steel pry bar. I was able to chop up the roots, poke the lever under the main trunk, and yank them out. Not easy, but doable. I did two in one morning, and I was feeling pretty smart. So accomplished, in fact, that the next morning I woke up a bit earlier than I had been, looking forward to knocking out the other two. 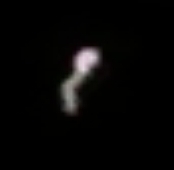 I had to take a small detour, though, to take a picture of what I’m thinking is Mars. I know, next time, hold the camera a little more steady. Anyway, the third stump was just as easy as the first two. I got a workout, but the stump was gone in a little over an hour. On to the fourth! That’s it? That’s all I removed after numerous whacks? You have got to be kidding me! What is this thing! It was a Bradford pear just like the other three; why is it so much harder? I used the pry bar as a spike and thrust it into the center. Thunk on the trunk! Let’s try that axe again. Whack, whack, whack. Pant, pant, pant. I keep saying it’s much easier to exercise by gardening because you can see something getting done. Really?! I stop for a moment to catch my breath and start thinking about, really, just how difficult is it to run up and down the street. Surely that’s a much better way to exercise than this! However, once I catch my breath, my new exercise plan shows it’s genius. I’m not going to be beat by a stump. I go at it again. Whack, whack, whack. Pant, pant, pant! No, running up and down the street is looking like a better alternative. No, wait, I have an idea. Enough brawn; let’s use some brains. It just so happens that I have a lot of wood from prior Bradford pears I cut down. Speaking of global warming, why not just plant these dang things all over the place? Carbon dioxide + Bradford pear = lots of wood, lots of leaves and lots of oxygen. Of course, if someone has to cut them down, they’ll probably burn up all that oxygen! So, back to the wood. I built a big fire, placed a metal protector around it and called it a day–or morning, if you prefer. I figured the next morning I would wake up to a hole in the ground where said Bradford pear used to be. After all that panting the day before I didn’t get up so early, but when I did, here is what I was greeted with. I felt like doing the Rocky victory dance. (You’ll have to just hum the melody yourself because there’s yet another law about using copyrighted music. I’ll wait while you finish humming so you can get the true effect.) I’m thinking about what I’m going to fill the hole with: maybe some of my compost, maybe loam from the mulch beds, maybe just clay. I’m already thinking about what else I can do after the five minutes it will take me to fill in the hole. Maybe I’ll plant some more vegetables, or flowers, or maybe pressure wash the fence to get it ready for the paint job it so badly needs. Maybe I’ll just take a day off and run up and down the street. Whatever it is, I get to decide. Enough gloating, let’s go look at the hole. WHAT???!!! 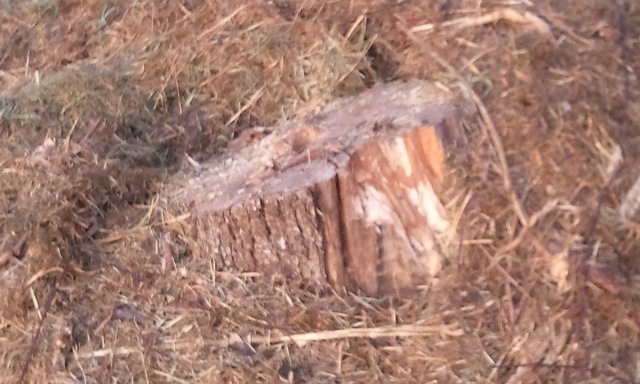 This is the stump covered in ash. After my first shock, I just started laughing. Can you believe this? 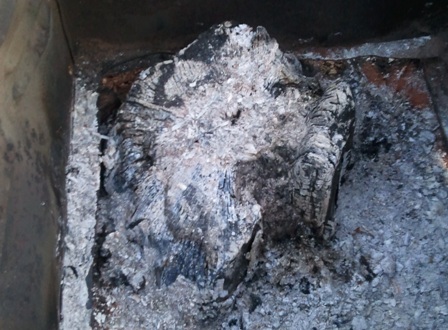 I had this covered with wood and every bit of it burned except the blasted stump! After realizing I was laughing at me and wondering what someone who might be up at this hour would think of the lunatic staring at a stump and laughing, I went back to being shocked. Another genius idea. Build houses out of these things! No more fires, except the things that did burn were Bradfords. Go figure. I’d take a cutting off this one but I’m thinking it’s a bit late for that. Although with this guy I can’t say for sure. Whack, whack, whack. Pant, pant, pant. I wonder how that rose is looking… not too bad if I may say so myself. There is nothing to this! Do whatever and then put black compost on the plant and you’re back in business. Um… the stump. Whack, whack, whack. After the third morning, more whacking, more fire wood, and another fire, and I’m still not done. On the fourth day he whacked some more! No Rocky victory dance this morning! Whack, whack, whack. Pant, pant, pant. Finally, the last little bit breaks off. It takes thirty minutes to gather all the wood chips that have been slung all over the place. My fiberglass reinforced axe is broken, and so is my fiberglass reinforced shovel. I used a rake to cover the hole and smooth it over. Finally, after so many years, these four stumps are out of my life. More good news. I got on the scales after all this and it looks like I have finally burned off the last of the candy and cookies I ate two weeks ago. What a setback that was! At least I’m back to where I was. The thing that seems to keep coming up is that if you figure out how many calories I burned while whacking and digging, it doesn’t add up to the weight I lost (using the 3600 calories = 1 pound rule.) I do believe it’s my metabolism. My muscles feel alive for several days after one of these grueling routines and my biceps feel like I can crack nuts with them! My youngest, who is a drummer and could beat me at arm wresling three years ago, arm wrestled me recently and lost. He may have just felt sorry for me but I’ll take the win anyway. Bottom line is… that thing about increasing your metabolism from exercising seems to be true. My wife wants me to plant another Bradford; I’m laughing so hard I just can’t type anymore. In my new quest to grow beauty as well as vegetables, I’ve been clearing out flower beds in my yard. A few years back I planted some roses, but that area had become quite overgrown. 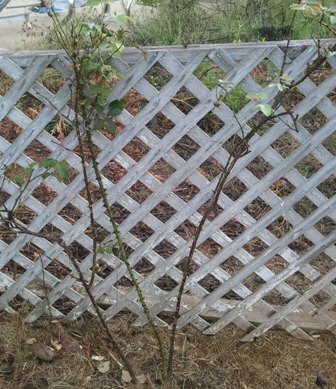 Early this summer, I noticed one rosebush was till making an effort, so I decided to clean out the area and try again. That old adage about ‘the best time to weed is when you don’t need to’ is so true. 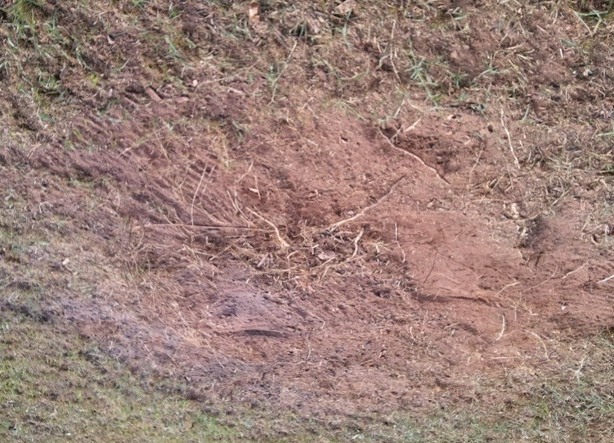 The area is a mere three feet by ten feet but it took shovels, a pick axe, levers, rakes and a bit of dynamite to clear it all out. Finally there it is… a rose bush. It looked a bit like an old woman who had done too much smoking and drinking but was alive, nevertheless. 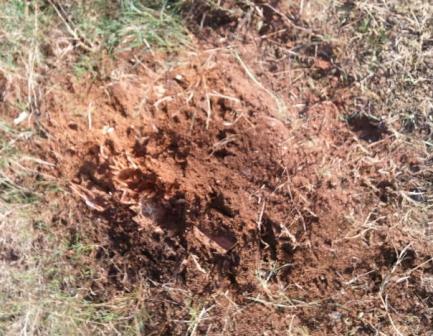 I cleaned up the vines around it, cleared out the grass at its feet, and removed a couple of opportunistic pines. A few new shoots gave me hope it might still come alive. And then there they were. The old woman had been doing a little more than smokin’ an’ drinkin’. She had several bulbs ( I found out later these are called hips) which I can only assume came from roses I never saw. Out of curiosity, I cut one of them open and found what looked like seeds. Roses have seeds?! Before I continue, it’s necessary to take a little side tour. I told you I was at a trade show peddling my goods (website development.) At the show, there was a Master Gardener booth supplied by Clemson University. Another detour… I found out later that a Master Gardener is someone with an interest in gardening who has taken a seventeen week course and agreed to volunteer for forty hours. The course is only given once a year and you have to apply to attend. So there I am at the “The 3rd Annual Upstate Women’s Show” watching fannies go by and eating way too many cookies and I decide to trek to the mountain top and talk to one of the wise ones. I had a simple question; “Where do you go to find answers about gardening?” The wise one replied “Like what?” Pet peeve… I hate it when people do that, I ask a general question and they want a specific example. 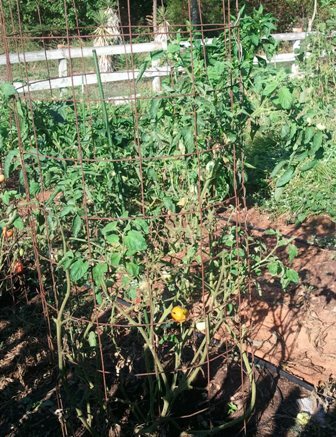 So I said, “Well, like when my tomato leaves are curling up and the plant is not looking so good, where would I go to find out?” He says, “Well that could be caused by several things.” I cut him off and say “Sorry, but that is not my question. What I want to know is where would I go if you weren’t there to find the answer?” He says “Well, there are some bugs that can cause that, too…” It’s a good thing I was raised by a mother who was quick to say “Watch your mouth” whenever I was being a little bit of a smart aleck because what I wanted to say was, “ARE YOU STUPID?” That never goes well so I tried once more; “I’m sorry, but you’re not understanding my question. Is there a place on the Clemson website where it lists all the things that can go wrong with plants in this area? Is there a national site that does the same? Where can I go to get more information so I can solve whatever problem comes up?” He said “Oh, I just Google it. Like, put in ‘tomatoes curled leaves’ and you’ll get a ton of information.” That’s too funny. That’s what I had been doing but it seemed there must be a better way. So dear reader, save the trek to the mountain top, just Google it. By the way, later in the day I went to a presentation on propagating plants and this kind soul brings me a print out about cucumber beetles and how they can attack your tomato plants. I have a picture of one of those things and didn’t know what it was! I thought it was related to a lady bug, a good thing, but instead it’s one of the villains. I also found out about stink bugs. I’m smarter already! Another diversion… One of the ladies at the presentation on propagating plants warned us about propagating patented plants. She actually used the words “azalea police.” And here I thought I was being so clever. I am currently trying to see if you can flush an azalea down the toilet and I’m setting up a surveillance system so I can get a head start when they come to get me. But seriously, I’ll have to Google the plants I bought to see if I’m allowed to do that. Back to the rose seeds. So I get back to my computer and Google “roses from seeds.” I get back 4,940,000 webpages related to this topic. I’m thinking that is an estimate rounded to the nearest ten thousand. How cool to live in these times! I’m an expert, “What do you want to know?” I read several articles and although it seems a little tedious and time consuming, you can get more roses from seeds! It actually sounds like fun. You can control who your roses fool around with and thereby create your own. I suppose if I went to all that trouble and actually came up with “The Rose,” I’d want to get paid for my “brilliance.” I have collected the seeds for the ’JoseFerrer 4510′ and the ‘Pep 9250′ and planted them. Most of the articles I read said that won’t work; some said it could. Not exactly a lot to lose there; cut hip open, dig out seeds, stick in soil. Wait a second while I Google “patent attorney”… wow, 1,160,000 results. Oh, wait, I need to google “mercedes slr”; 1,880,000 results. I’m so exited! I seem to be standing on a soapbox; let me put that away and go back to rose seeds. Sorry, I can’t. Just because you read it on the Internet does not make it a fact! If it says put the rose seeds in a ham sandwich and bury that six inches, you might want to Google a little more, or maybe ask an expert. Okay, really back to the roses. I added some of my compost around the base of my newly discovered rose, watered it with my Miracle-Gro mixed with rainwater from my rain barrel, and wished it well. We’ll see. After reading many articles on growing roses from seed, it seems I need to wait a bit longer and then go through a drawn out process on cutting out the seeds, refrigerating them, planting and waiting. We’ll get back to that. I also found out you can propagate with cuttings, so I cut a few and tried one of the methods: dirt, water, plastic bottle. We’ll see. So yes, roses have seeds and you can plant your own! I haven’t done a good job of keeping up this blog but to bring you up to date, after weeks of staying a steady 280 pounds, I finally lost about eight more in a matter of days. Mostly working at clearing weeds (that’s hard work!) So there I am, a slim 272 pounds. (Hey, from where I came from (300 pounds), it does look slim.) So, I’m feeling great and looking forward to getting into the two-sixties. All is going well except… I’m at this trade show, for three days, with cookies and candy, right at my finger tips. Bored, bored, eat candy, bored, bored, eat cookie. Promise not to eat any more. Watch fat fannies go by and really promise not to eat any more. Bored, bored, eat candy, bored, bored, eat cookie. Realize that that is probably not going to help me get my weight down so, instead of eating another cookie, I go down the hall and get a free yogurt. AS IF THAT HAS NEGATIVE CALORIES! Then, when the show closes, I go out and eat a late night meal. Three days of this and, guess what? I gained six pounds. How is that possible? Ah, eating cookies and candy, doofus. What a strange vehicle we all live in! I watched thousands of people go by at the trade show and I would guess about ninety-five percent needed to lose at least some weight. The other five percent were genetically deficient. One twenty-something young lady walked by who had a waist about the size of my biceps. How that made it out of the gene pool escapes me. Can you imagine? There she is on the savannah plains and hasn’t eaten for two hours. She would have starved to death! She has no reserves whatsoever. Then there’s breeding. I can see an early man negotiating with her dad… “Let me get this straight, you want two of my cows for that bag of bones for which I will have to slaughter two more cows just to get enough meat on her so I can find her? Ah, no thanks. I’ll take the one in the kitchen with the two cookies in her mouth. If she knows how to make candy, I’ll up the offer to three cows.” There is no way that DNA structure would have survived. It’s got to be a recent mutation. So here we are in a world where you can buy cookies and candy in thousands of flavors at millions of places, living in a body that thinks it’s going to starve to death at any minute. We don’t even have to climb a tree to get the goods! It’s so depressing I think I’ll eat another Tootsie Roll. Maybe that’s not such a good idea. The challenge for today is to not eat another sugar, flour and lard concoction. It’s five thirty in the morning, I’m awake, I’ve been eating a little too much, and this is a perfect way to punish myself. So I get up and decide I’m going to go pull some weeds. Ah, it’s a little dark. 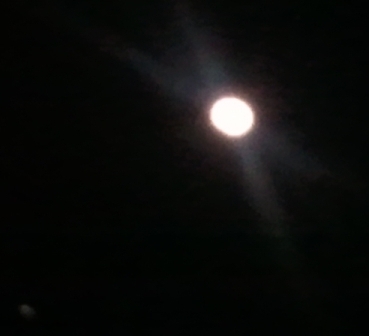 However, the moon is pretty full and, with a little squinting, I can see what I’m doing. So off I go and start to clear more of the three year old mulch beds. A little weird but, hey, I’m down almost thirty pounds. Well, at least that was yesterday morning. This morning, I’m more like down twenty-five pounds. Want to know how I gained five pounds in two days? Read on. We decide to go to where our son is and wait for him to get done so we can decide where else we can go to get vegetarian. Do you know how much sugar you have to put in a cookie to get it to eighty calories?! I’m starving! Finally, we decide to go to Monterrey’s, a Mexican restaurant where you can order fajitas without the meat. Are you serious? Anyway, they bring out chips and salsa. I eat the whole basket and ask for more. Then, when it’s time to order, I order the Texas fajitas and ate the whole thing! There is a responsible side of me but all it could do was say, tomorrow morning you’re going to get up at five am and burn this off! So here I am. pulling weeds by the light of the silvery moon. It’s Time to Buy Azaleas? My wife loves azaleas and, for thirty plus years, I’ve been wanting to get some for her. But when I go to the store I’m shocked at what they want for those plants. This year I decided to do it no matter what. I did a little research and found out that fall is actually a great time to plant azaleas, so I thought I would get a couple of plants and see how it goes. Imagine my surprise when I get there and they’re on the discounted rack. Apparently, no one wants to plant azaleas in the fall! The reasoning I’ve heard for planting azaleas in the spring is that you can’t tell what you’re going to get until they’re in bloom. So you buy the plant with all its pretty little flowers, you put it in the ground and then all the flowers die. Doesn’t make sense, does it? Anyway, because no one is buying, here are two plants marked down more than 50%. Too bad my wife reads my blog, I could get bonus points if she thought I splurged and bought her some prime azaleas. She’d probably start wondering what I’ve done wrong. Oh well, maybe it will count for something anyway. 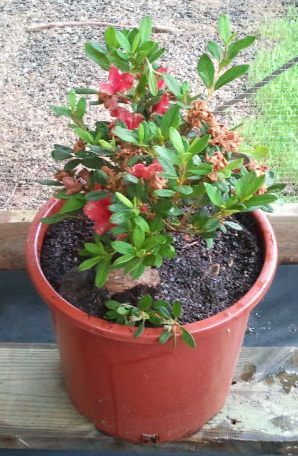 So, for four bucks and eight bucks I’m now the proud owner of two reddish looking azaleas. 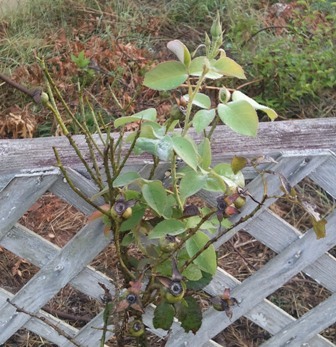 One had blooms on it with no tag; the other had a picture, but no flowers, but it claimed it bloomed in the fall. Maybe not. I want reddish flowers so, hopefully, the one with the tag actually has an image of what I’m going to get. I probably haven’t mentioned that I’m cheap; I can save the four bucks! 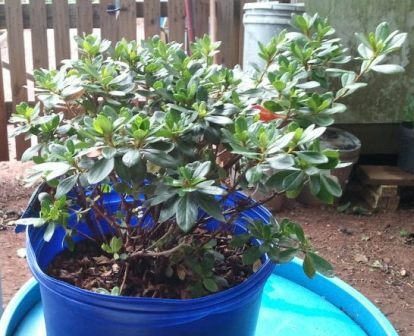 After reading a bit, I found that this is the best time of year to propagate azaleas. ”It’s easy,” they say. There were several methods that I found, but I opted for the simplest. 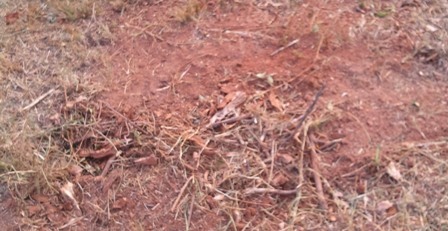 Bend some twigs down, cover with dirt, and put a rock on top to hold them down. I can do that. You can see my handy work in the image to the right. After transplanting into larger pots, I put them in a lightly shaded spot. That was easy! Not so fast there, buster. Did you know that it is technicaly illegal to do what I just did? I verified it! However it’s done, companies can get a patent so that when you buy that plant, you’re buying a license to view the plant but you may not allow it to procreate. An attorney’s wording may be a little different. You think I’m making this up, don’t you? I’m serious! If my little rock method works, I’m supposed to pay a royalty to an unmentioned company. Bill Gates, do you see what you started? Or is it the other way around? Maybe Bill Gates’ dad wanted him to plant some azaleas when he was a kid and, being the lazy programmer type, he spent hours researching how to get out of five minutes of work. Aha! It’s illegal! From there it’s a short leap to ”I wonder if I can do that with software.” Whatever! I’m not going to worry about it, but if some day my blog just stops, you’ll know what happened. The azalea police got me. I wonder where you’re supposed to find condoms for azaleas. When we moved into our house many years ago, there was a shallow concrete pond which I was told was a duck pond. How nice! So when I trimmed hedges, there was a convenient place to put the clippings. I was thinking more like, “There’s a nice place to put all this trash. Out of sight, out of mind.” Well, if you do that enough times, next thing you know there’s black gold. I’ve always read that you’re supposed to have an enclosure, turn the compost over several times a year, water it regularly, blah, blah, blah. I’ve discovered that if you throw the stuff in a pile and walk away, you pretty much get the same result. There is some seriously black dirt under there! Still, I couldn’t help myself; I took a pitchfork and started to turn it over a few times. That’s a little like work, so I quit. 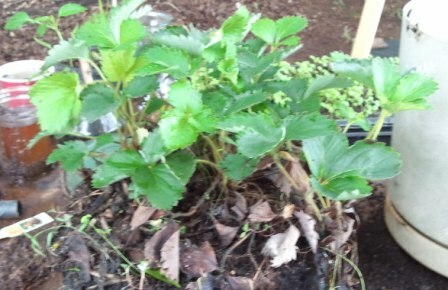 I had a strawberry plant the we bought a couple of years ago that we never got around to planting in the ground. I had thrown it in a bucket “until I have time to plant it.” You know how that goes. Or maybe you don’t. We have a bad habit of ging to the store and thinking it would be nice to have some (fill in the blank.) This time it was strawberries. Two years and this thing is not dead yet. Most plants give up on me long before that! 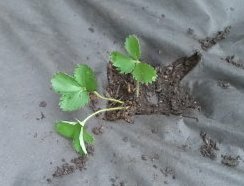 So, here we are, one “I’m not going to die” strawberry plant and one big pile of black dirt. I used to work in and around Plant City, Florida, and the farmers there would pile up rows of dirt, cover them with black plastic and they would get beautiful, large strawberries. I thought I would try that. I didn’t have any black plastic handy so I used some weed blocker fabric. I’m not sure if the plant will know the difference. The one plant had about five separate sections that I was able to break apart and plant individually. My pumpkin is starting to actually look like a pumpkin. On days when we have a hard rain, it seems to double in size overnight. I’ve only had one other pumpkin get close to this size. Some bugs got into it and it ended up looking like a zombie pumpkin. But this one is looking pretty good. I haven’t sprayed it with anything but, so far, there are no bugs that look like they have an eye on it. 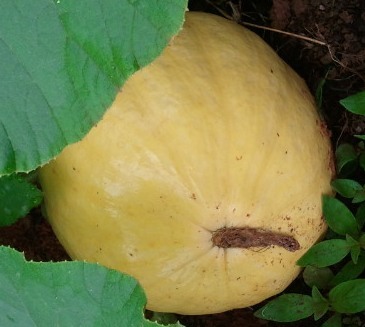 At the other end of the vine there is a new baby pumpkin. It would definitely be cool if I had a couple for Halloween. I’m going to put some of that “black gold” around the base of the plant and see how it does. I’ve had a lot of flowers but, so far ,these are the only two candidates vying for Halloween. This morning, if I stood on the scale just right it said I weighed 279 and 31/32 pounds. I was sure after yesterday’s workout I would wake up weighing 175 pounds. Why is it that if you just look at a cheeseburger (which I haven’t) you gain weight but if you eat cucumbers for supper (which I have) you don’t lose any weight. Still, I feel better than I have in years and I can actually get into those jeans I saved from five years ago. No, I’m not going jogging!